SCARS: What originally attracted players to video games? What attracted you? WEISS: As a kid, the ability to manipulate images on the television screen—to control the action—was awesome. No longer was TV a strictly passive recreational vehicle. SCARS: What do you think players are trying to accomplish and hoping to find in video games? WEISS: I hate to read too much into it, but I suppose for some it’s the feeling of control and power that they don’t have in real life. Also, beating a game (or a friend) or improving upon your high score gives you a sense of accomplishment. SCARS: What were most video games about in the early 1980s? WEISS: Good, simple, challenging fun. SCARS: How was the video game industry in the years 1982, 1983, and 1984? WEISS: 1982 and '83, exciting. 1984, depressing—I was bummed when the ColecoVision and Atari 5200 ceased production. 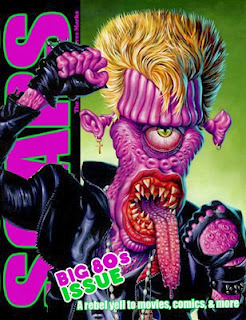 SCARS: How would you describe the social atmosphere of early ’80s arcades? WEISS: They were at once competitive, welcoming, loud, frenetic, flashy, and fun. The games were simple to learn, yet tough to master, creating a diverse, highly charged environment. SCARS: Joysticks was obviously done for laughs, but does the film capture the time accurately? WEISS: Joysticks has some entertainment value as a so-bad-it’s-good film, but it doesn’t resemble reality in any form or fashion. It’s silly, sophomoric, poorly acted, poorly plotted, and just plain dumb. Having said that, the girls in the film are cute, and it’s cool to see games like Satan’s Hollow, Gorf, and Super Pac-Man in action. For a film that better captures the era, stick with Fast Times at Ridgemont High. SCARS: What's your opinion of Cloak and Dagger? WEISS: For an adventure/spy/video game film aimed at younger viewers, it’s not bad. It’s very watchable, actually. The performances are sincere, and I’ve always wished I could go to that game store depicted in the film. SCARS: Cloak and Dagger features the Atari 5200. What's the legacy of the 5200? WEISS: The Atari 5200 is a great system with lousy, non-centering controllers. I have a Wico replacement joystick, and it works great. I still play Pengo, Space Invaders, Robotron, and several other games for the system on a semi-regular basis. SCARS: What caused the industry to bounce back after The Great Video Game Crash? WEISS: The release of the NES in 1985 was a major factor in resurrecting the console industry. In particular, Super Mario Bros. was such a revelation and so much fun to play. It gave gamers unprecedented control over the protagonist, tons of secrets to uncover, cartoon-like graphics, and a sense of movement and progression seen in few previous games.